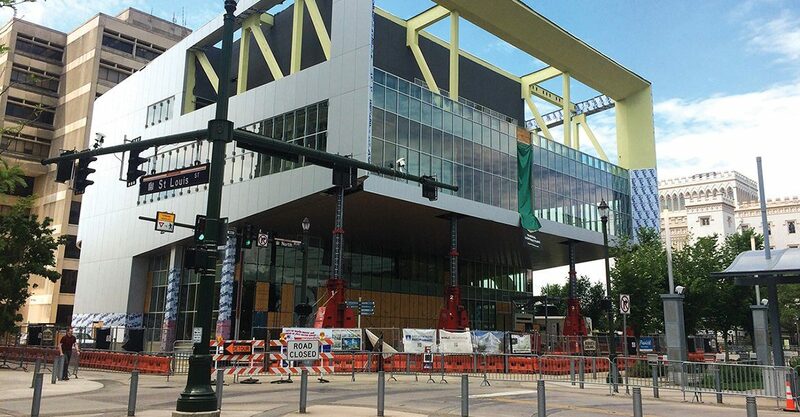 The East Baton Rouge Parish Library System will front the nearly $2.75 million needed to resume construction on the stalled River Center Branch Library downtown—provided the Metro Council approves the requested spending measure. In separate statements issued this afternoon, Mayor Sharon West Broome and Library Board of Control officials say the Broome administration will ask the council at its next meeting to approve a change order to the project in the amount of $2.746 million, which will enable contractors to make repairs to the building and resume construction. The funds will come from library system reserves, which, it is hoped, will be reimbursed once litigation over who’s responsible for the structural failure is resolved. The arrangement doesn’t resolve the ongoing legal battle over the project, which has been on hold since a structural failure in the building’s signature cantilever overlooking North Boulevard Town Square was detected last April. But it is a significant step in addressing what has become an embarrassment and an eyesore for the administration. In a statement seemingly designed to thwart any pushback of the effort to use additional public funds to resume construction, Broome says there are more important reasons than merely aesthetic concerns to repair the building as quickly as possible, namely the longer the project lingers, the worse the damage will become and the more expensive the repairs.